The Attack Democrat--Nothing Conservative Here: Who needs a Glock? You can’t hunt with it unless, of course, you are hunting people. The only thing you can do with it is kill people, lots of people, quickly. I'm talking about the Glock 19 semiautomatic handgun, particularly when it is loaded with a high capacity magazine that lets you fire 31 rounds as fast as you can pull the trigger. It is the gun Jared Lee Loughner is accused of using to shoot Rep. Gabrielle Giffords in the head, kill six others including a nine year old and wound 14 more. Between 1994 and 2004, Glocks with high capacity magazines were banned. Loughner might have been able to get one anyway but it would have been much harder. He would have been stuck with a plain old gun, one that shot maybe 10 rounds or less before he had to reload. He might still have been able to shoot Gifford but the others he killed and wounded might have had a fighting chance. He would have run out of ammo a lot sooner. Someone might have been able to wrestle him to the ground while he was trying to reload and a nine year old and the others might be alive today. Instead, this apparently mentally ill, drug using, failure could just walk into a store and buy a Glock and all the high capacity magazines he wanted. Then he was able to walk to a shopping center and spray 31 rounds into a crowd in just a few seconds. We don’t have a law banning assault weapons like the Glock today. Congress has been too afraid of the National Rifle Association to pass an extension of the assault weapons ban. So we let just anyone buy a Glock and fit it out with a high capacity magazine. If they are in Arizona, they can walk around concealing the weapon and a pocket full of high capacity magazines for as long as they want without the need for a permit or any kind of background check to insure they aren't a homicidal maniac. Next time you go to the supermarket or go shopping at a mall think about it. Some crazy may be walking next to you packing a Glock, ready to unload 31 quick rounds just for the fun of it or just because they think killing a bunch of people fast will make them somebody. Tell me members of Congress and you NAR folks, I want to know. Who needs a Glock with a high capacity magazine beyond members of the military or law enforcement officers? Why is it so important for any American to be able to buy weapons in this country that fire off 31 rounds in a few seconds, weapons they can easily conceal until they pull them out to kill lots of innocent people, fast? How would our sacred Second Amendment rights be violated if we could only buy guns that shot 10 rounds in a few seconds or six rounds? Would that be so bad? Tell me, I want to know. Explain your support for letting Americans continue to buy people killing assault weapons to Loughner's victims and there families. Defend the right of people like Loughner to get easy access Glocks with high capacity magazines. Go ahead. Explain yourself. As a Conservative I support the Right to Bear Arms. First and foremost I do not believe it is necessary to carry 31 rounds in any gun unless you are in law enforcement or fighting in a war. Guns should be designed to kill people because if you need to defend yourself (which many liberals would rather let your family get raped in killed by thugs) your weapon should be able to kill a person. You Criticize Glocks like they are assault rifles and they are not. They are a pistol. Most people only carry 10-12 rounds in them and i think that should be the limit. But he could have done the same thing with Springfield, Ruger, Smith & Wesson. The Essential issue is that Loughner would have done this with any weapon from a knife to a pistol. He wanted her dead and would have done it. The real issue now is people with mental health issues should be listed and verified. We need extensive backround checks and data bases. We need to go back to the days of Committing people and evaluating them appropriately instead of giving people who are clearly crazy the right to check themselves out of a mental institution. He could have done the same damage with a single shot break open shotgun because he is crazy and motivated. Its the person not the Firearm. Glocks get a bad rap because thugs use them as signs of toughness. They are just handguns with an easy to say name. They are becoming the Kleanex of Handguns. 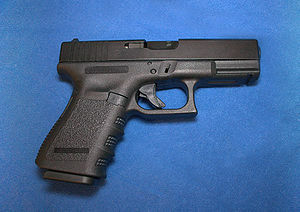 A Glock is a German Synthetic handgun. They are the staple of Law enforcement across the nation. Thank your Local police man for most likely carrying one. Its the Person not the gun. And as far as being able to carry a gun. Maybe if someone was also carrying that day they would have drawn on him and stopped him. The right to bear arms protects us from crazy people. I wish more people were carrying a gun that day because i guarantee a concealed carry citizen who follows the law would have done their civic duty and drawn and fired. I know plenty of Liberals that reserve their right to bear arms. But ill agree with you one more time. We dont need 31 round Magazines. But Criminals do have them and they dont buy them legally. They Have Auto Uzis and AK 47s. I understand this nut bought his gun legally but most career criminals use an illegal gun and they are the main concern not legal guns. An illegal gun should be more Prison time than any drug. And yes you can carry a gun while hunting. Hunting isnt safe. Bears do exist. Firing a rifle at a charging bear may not be smart because he will be on you quick and you cant get many shots off. A glock as a side arm will do you good. We need Better Gun awareness not control of how we buy them. Everyone who buys a gun should be Finger Printed, Photographed, Registered with their firearm and be able to produce that firearm every 6 months to the authority to prove you still have it. The only exceptions would be a proof of sale on that firearm or a slip that it is being repaired from a licensed Federal dealer. You would then need to produce that weapon as soon as you get it back and will be checked on again within 3 months and they will need to be able to contact the manufacturer or dealer as to the status of the handgun possibly seeing the gun that its not in the wrong hands. When a gun is stolen it should be reported right away and there should be an investigation as to the location of that gun. If that gun is found that person should do a minimum of 8 years. This was an emotional Event but Gun control isnt the answer. Reasonable regulation such as magazine amount is the most id go. As well as Automatic and Assault Rifles. The real issue is gun awareness and registration. Including comprehensive Data Bases on people with mental health issues that will need a doctors permission to purchase a handgun. Also each gun owner should be finger printed and the rest of the regulations i have mentioned. Final thought. Blame the person. He would have attempted to kill her no matter what weapon or object he needed to use. He was insane. Stop blaming Glocks because it is the convenient way scapegoat. "He would have been stuck with a plain old gun, one that shot maybe 10 rounds or less before he had to reload. He might still have been able to shoot Gifford but the others he killed and wounded might have had a fighting chance. He would have run out of ammo a lot sooner. Someone might have been able to wrestle him to the ground while he was trying to reload and a nine year old and the others might be alive today. " Maybe if more citizens were carrying they would have drawn on him. Taken him down and killed him on the spot. @ anon #1 -- 1) You can't kill 6 and wound 13 with a knife; 2) Liberals want to sleep peacefully at night, knowing their strong gov't has locked up all the dangerous people and gotten all the guns off the streets; 3) I find yelling and banging a pot works just fine in driving off bears. Of course, I'm just chasing them off my porch, not stalking them down to kill them for fun; 4) Not sure how you plan on limiting ammo carried, when Cabela's sells it for 17¢ a bullet. @ anon #2 -- I really liked the movie TOMBSTONE. It was cool, especially when Val Kilmer says "I'm your huckleberry" before drawing faster than the other guy. I really like your idea of turning our everyday lives into Tombstone by arming everyone. I'm a bad shot, but a quick draw, so I think I'd have a fighting chance in your utopia.